If you need to complete quick project and you are ready to spend some money for it, this premium WordPress portfolio theme showcase will definitely interest you! This is follow-up article to previous one about free themes, check it out – 24 Free Portfolio And Photo Gallery WordPress Themes. I think it’s okay to spend few bucks for great theme with full support and many features for fast projects. I just bought one as well, just because I needed to set up site rapidly fast, but I had specific requirements for that blog. I visited several premium theme sites and found good looking theme I was happy with in 30 minutes. It was interesting experience for me and this research was quite exciting as well – when I went through these themes I found out several modern jquery features many sites do not offer just yet, interesting designs..really premium like! Even if I didn’t buy anything this time, I got a lot of inspiration and new ideas just while browsing! Enjoy and let us know which was your favorite theme? 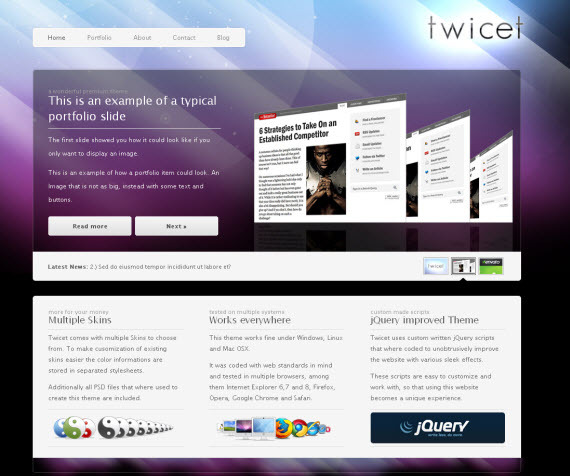 DISPLAY is a WordPress Theme, best suited for Business and Portfolio sites. It comes with a fantastic 3D Image slideshow that can be controlled from your backend with a custom tool. The Theme has a huge wordpress custom backend (8 additional Admin Pages) that make customization of the Theme easy for those who dont know much about coding or wordpress. The Theme also comes with a more subtle fading image slider. You can use this slider as your main slider, otherwise it will be used as a fallback if the users browser doesnt support flash.